Let's give the handouts a break for bit. I'm tuckered, but I have a GREAT and YUMMY treat for you. LION HOUSE ROLLS!!! Now I can't just ship a batch over to you so here's the recipe of the famous, water-mouthing, try and never turn back rolls. ~2/3 cup nonfat dry milk *SCORE FOOD STORAGE ITEM!! In large bowl or electric mixer, combine water and milk powder; stir until milk dissolves. Add yeast, then sugar, salt, butter, egg, and 2 cups flour. Mix on low speed until ingredients are wet, then for 2 minutes at medium speed. Add 2 cups flour; mix on low speed until ingredients are wet, then for 2 minutes at medium speed. (Dough will be getting stiff and remaining flour may need to be mixed in by hand). Add about 1/2 cup flour and mix again, by hand or mixer. Dough should be soft, not overly sticky, and not stiff (It is not necessary to use the entire amount of flour). Scrape dough off sides of bowl and pour about one tablespoon of vegetable oil all around sides of bowl. Turn dough over in bowl so it is covered with oil. (This helps prevent dough from drying out). Cover with plastic and allow to rise in warm place until double in size. Sprinkle cutting board or counter with flour and place dough on floured board. Roll out and cut rolls into desired shape and size. Place on greased (or parchment lined) baking pans. 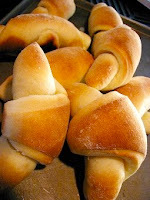 Let rise in warm place until rolls are double in size (about 1-1 1/2 hours). Bake at 375 degrees F for 15-20 minutes or until browned. Brush with melted butter while hot. Makes 1 1/2-3 dozen rolls, depending on shape and size of rolls. NOTE:You can freeze shaped rolls for later use. Simply double the amount of yeast used when making the dough. After the first rise, shape the rolls but do not rise again. Instead, place rolls on a baking sheet and immediately place in freezer. When dough is frozen solid, remove rolls from pan and place in a plastic bag, squeeze excess air out of the bag and seal. Rolls can be frozen for 3 weeks.